We are dedicatedly engaged in developing and offering an impeccable range of Table Jugs to the patrons. 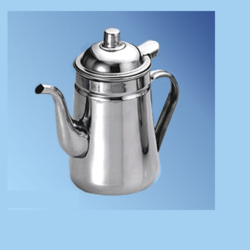 Customers can avail from us a gamut of China Jug, Milk Jug and Diamond Pitcher Jug, under this category. These are made employing latest machines and instruments as per the contemporary market trends. The jugs we offer are acclaimed by the clients for their attractive patterns, splendid finishing and stain resistance. Our offered jugs find their extensive use in various bars, restaurants, canteens and homes for serving purposes. 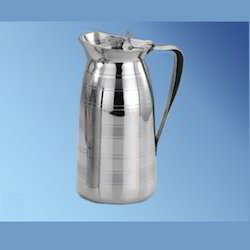 Being a patron-oriented enterprise, we work to come up with a range of Stainless Steel Jug. All our products themselves display the craftsmanship of our experts from their designs and looks. For meeting the diverse needs of clients, we offer these jugs in different in variegated sizes, shapes and designs. 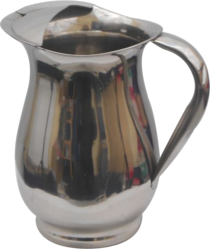 Made available by us is a wide and remarkable range of Diamond Pitcher Jugs. As the name suggests, these are extensively used for serving pitchers in various hotels & restaurants, bars and homes. The products we offer have attractive looking handles and lips that aid in holding as well as pouring liquids without any drip. For meeting the distinguished needs of the clients, we offer these jugs in a variety of designs, sizes and shapes. Backed by the profound experience of the market, we have been able to bring forth a collection of Milk Jugs. These are made using supreme quality stainless steel, which we source from authentic vendors of the market. Ideal for serving milk, the jugs offered by us are widely appreciated for their perfect grips, resistance against stains, innovative designs and is easy to wash. Furthermore, to ensure safe transits and keep these jugs away from scratch, we provide these to customers in qualitative packaging. Looking for Table Jug ?